Sometimes combining sweet and salty just has to be done. This time the salty comes in the form of bacon. These cookies are for the true bacon lovers out there. 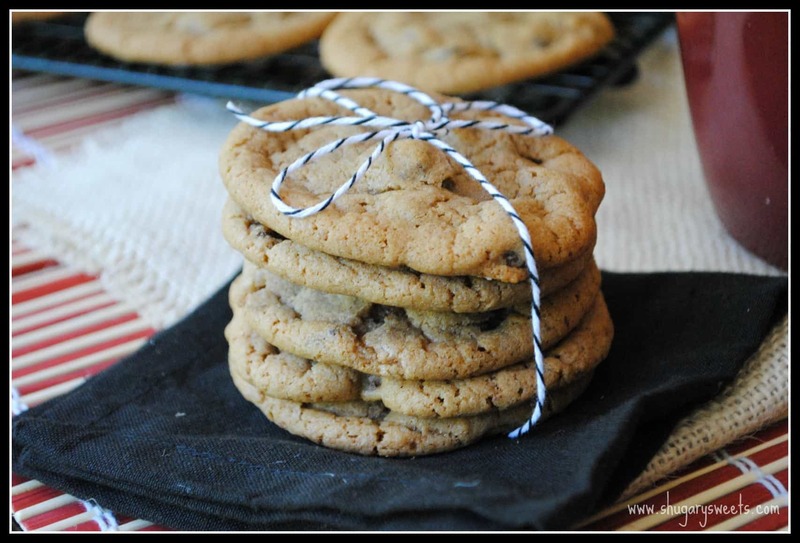 The smokiness of the bacon, combined with the brown sugar and the chocolate chips and the maple flavor, OH MY! Now, if you’re a planner, make sure you read the note in the recipe to bake your bacon ahead of time. I like baking mine with brown sugar, just to add an extra step of sweetness, but you don’t have to do that (you could also use maple bacon). Okay, I completely understand not joining in a “trend”. I’m the girl who was still wearing leg warmers when it wasn’t cool, and rolled my jeans up far longer than necessary. I get it. But don’t be late on this one. Give it a try. And if you’re not convinced, I’ll be happy to take all your leftovers. NOTE: Before starting, cook bacon. Lay 4 thick slices of bacon on a small baking sheet lined with foil. Top with 1/3 cup brown sugar. Bake in a 400 degree oven for 20 minutes. Remove from pan and cool on piece of foil. Cut into small pieces when cooled and set aside for cookies. In mixer, beat butter with brown sugar for 4 minutes. Add salt, eggs and maple extract. Slowly add in flour, baking soda and baking powder. Fold in bacon and chocolate chips. Scoop by large tablespoons onto a parchment paper lined baking sheet. Bake in a 375 degree oven for 10-12 minutes. Allow to sit on pan 2 minutes before removing to a wire rack to cool. Enjoy! hahahaha! I’m going to take your word on how good these cookies are:-) I just can’t seem to get on board that bacon train…unless it is 100* out and the bacon is in a sandwich with lettuce, tomato, and mayo. I know, it’s strange that I can eat it that way and no other way!!! But for the record, I think your cookies look pretty tasty!!! What? You don’t even LOVE bacon on it’s own? I do love a BLT too!!! Nope I have no love for the greasy stuff:-) But give me a BLT and I will go to town!!!! I am with Jocelyn on the bacon in sweets thing. But! Something tells me my Hubby will actually like these! I need to try them! Don’t you get on Jocelyn’s wagon here! Make some for hubby and give them a try. SO SO good! Alright, I’m intrigued!! Usually the idea is something I can’t completely get behind, but these look perfect. I LOVE BACON AND MAPLE. It’s so awesome. I had a bacon maple doughnut in Oregon one time and oh my goodness it was a total party in my mouth. I love these cookies! THANK YOU! The doughnuts were the first I’ve tried too. Now I want to make bacon maple buttercream and put it on a cupcake. Oh, yum! I LOVE the bacon/maple combo. I will definitely be trying these cookies. Thanks for such a great recipe! I just about had a heart attack when I saw this. SO AMAZING!! I am pretty sure my husband would go crazy over these cookies. He LOVES bacon, or as he calls it the fifth food group. Thanks for the recipe! Oh my is right! This is a tasty combination!!!! I wish I could have those donuts with my coffee tomorrow, do you deliver? I don’t eat much bacon because it always has so much fat and grease, but I actually like the flavor. These are piquing my interest big time though. I think I’m gonna make them! My man will be quite pleased, I’m sure. I wonder how a maple bacon cupcake would be?? I think it would be awesome. I actually just did an awesome maple bacon recipe. But the pics look SO autumn-y that I’m waiting to post. AWESOME flavor combo. Donuts are the BEST! I am in love with anything that is bacon…tastes really perfect with a hint of maple syrup. Let’s get it on for a delightful breakfast. Thanks for sharing! All of my favorite breakfast tastes into one cookie? I’m in love. Maple and bacon are a match made in heaven!! 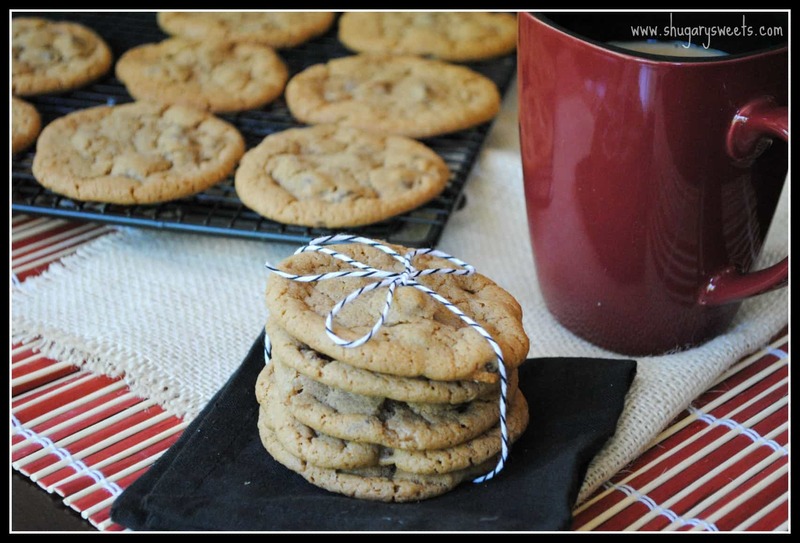 I could go for one of these cookies after I polish off a nutella stuffed muffin! What a pair that would be!! Yum! I am sure my kids would love this! They tasted seriously ah-mazing too! 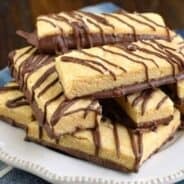 super creative & fantastic recipe – who doesn’t love the sweet & salty combo!? OK- I’ve been intrigued by the bacon in my baked goods trend, and these look awesome! Must try! I tried the Maple Bacon cookie at Schmackary’s in Hell’s Kitchen in NYC and fell in love, so I’m gonna try this recipe out! There weren’t any chocolate chips in Schmackary’s, so I think I’ll exclude those…hopefully they’ll still be as great as they look. Maybe butterscotch chips would be tasty…? I’m sure they will be just perfect. Although I’ve never had one from Schmackary’s, not sure if it will be the same at all! Still delicious! Bacon makes everything better. It should totally appear in more desserts. These cookies look so yummy and sound like the perfect balance of salty and sweet! This recipe sounds DELICIOUS. Question though: why did you choose to use maple extract over maple syrup? 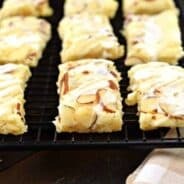 I wan’t to make these soon but I can’t find maple extract anywhere. Any suggestions on subbing syrup? This had me cracking up! Thanks for the chuckle tonight, glad you enjoyed them!! YUMMY! Quick question, in the ingredient list you say the recipe calls for 1 3/4 C brown sugar, then in the steps we add 1/3C brown sugar to the bacon. I am assuming the 1/3C is in addition to the 1 3/4C in the dough, is that right? Hi Kelly, it is in addition. I guess I need to fix that in the recipe 🙂 ENJOY!!! Just made my first batch of these – came out a little fluffier than I would have hoped but still a great combination and a wonderful taste! Bringing them to a work meeting tomorrow! I really wish you hadn’t shared this! I’m going to have to make these! Oh and since there’s bacon in these, they’re perfect for breakfast, right? Sweet and salty is a combo I never get tired of…and there’s bacon too – I’m sold! Annnnddd… you had me at bacon. You can never go wrong with Maple and Bacon. Yum! Pinning now! Thank you so much for posting this recipe. 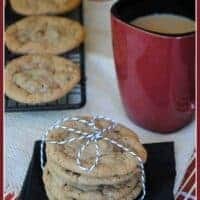 These cookies are absolutely amazing!! I can’t wait to give this one a try! LOVE bacon –pinning! Just made these in preparation for father’s day tomorrow, AMAZING! Followed the recipe exactly except I used Beer Candied Bacon instead of plain bacon, which brought it to a new level. These are excelent and produced some good looking cookies too. Will be adding these to my favorite recipe collection! Thank you for posting this. So glad you liked the cookies!! I’m definitely making these! Hubby is heading on his fishing trip with the boys and they love bacon! Plus our family is pretty adventurous… Made a Peanut butter bacon cheesecake with caramel and maple topping… not to toot my own horn but DELICIOUS! 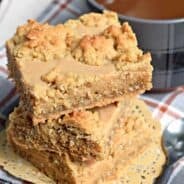 Could I use maple syrup instead of the extract? Maple extract (flavoring) is much more concentrated than syrup. So it definitely can’t be swapped to get equal results. I can’t wait to make these! Is it 1 3/4 cups light brown sugar + the 1/3 cup for the bacon? Or is that included in the measurement? Any suggestions to how I could use the 100% maple syrup in place of using the extract?? Just made these this weekend! I couldn’t find any maple extract, so I used maple syrup, but used about 3 tsp instead of the 2 the recipe calls for. Aimee is definitely right — it’s not as concentrated, so the flavor doesn’t come through the same, but in my opinion, it still added enough maple flavor to taste! I’d love to try it again once I can get my hands on some maple extract, but for now, they turned out perfectly!! My boyfriend LOVES them! Thanks so much for the recipe!! I’m glad you enjoyed the cookies! Definitely give them a try with the extract!! I would love to try this recipe, but when I used the print feature the link to that Probiotic Pearls ad was on my recipe! Sorry, but I can’t have that in my files. I’ve printed lots of recipes from websites that have coupons on them and never before have I gotten one on the printed out or saved recipe. I have no idea why that happened! Is the 1 3/4 cups light brown sugar + the 1/3 cup for the bacon? Or is that included in the measurement? I picked this recipe over all the other ones. The cookies turned out ridiculously good. They were inhaled by my coworkers when I brought some for them to try and my son just loved them. I am baking another batch today. 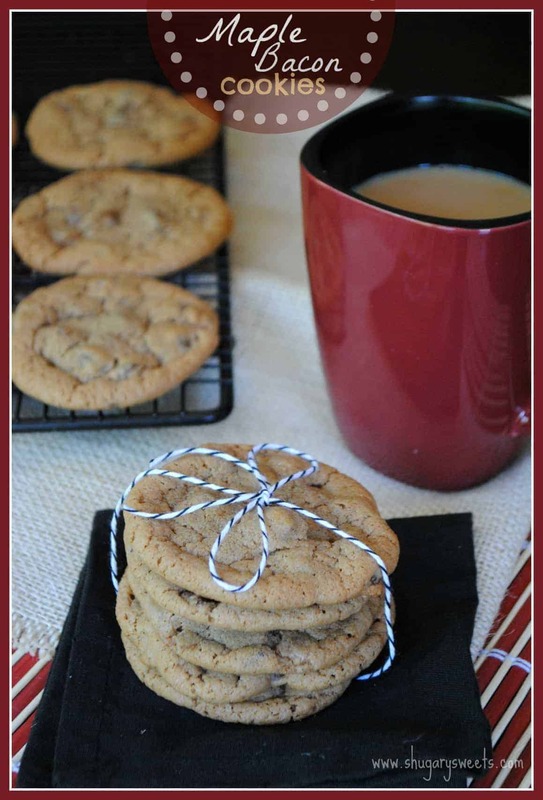 Try it with butterscotch chips… you won’t be disappointed! I love butterscotch chips, what a great tip! Glad you enjoyed the recipe! I tried maple syrup but the end result was cake like and not cookie like. I just bought nestle tollhouse maple chips (like chocolate chips but maple flavored I guess!). Could I sub them in for some of the chocolate chips and omit the maple extract? You could totally try that! Let me know how it works out! Probably why I HAVE to always have a batch of Bacon Jam in the fridge…….. I was wondering if I could use some of the bacon jam in this instead of slices of bacon????? Say maybe a spoon full of bacon jam for each slice the recipe calls for?? I don’t mean to sound lazy but here sliced , cut or crumbled cooked bacon doesn’t last.. They would never “allow” it to sit long enough to go into a recipe.. lol I’m lucky I can get the raw stuff into he pan to join the rest of the jam ingredients!! Oooh, a little dollop of bacon jam sounds like a delicious addition! Very nice to have a reply unlike some other foodie sites where a comment gets post then removed and/or ignored! I’ll let you know how it works out..
Definitely let me know how it turns out with the jam!!! Using Bacon Jam worked great! The result was a rich , balanced very tasty cookie.. Some of which are now winging their way across the country in “cookie packs” to the few we send to each year.. Thank you so much for sharing the recipe and your replies to my posts.. hehehe I’m sue I’ll be back! off on my food ball search lol! Thanks for coming back and letting me know!! I’m sure your family and friends are going to love their cookie packs!! Hi! These fit perfectly for the cookie swap I have coming up!! I was also wondering about the brown sugar and didn’t see an answer above. Is the 1/3 cup for the bacon in addition to the 1 3/4 cup in the cookies? Thank you!